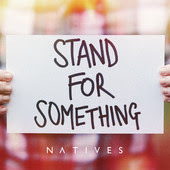 NATIVES - Stand For Something (EP) (8). Natives are a rock band from the New Forest Hampshire who are about embark on a UK tour later this year. The title track from their EP Stand For Something is a tour de force of strong passionate vocals, electronics, bright shiny guitars and an insanely catchy chorus. This is the sound of summer, fresh vibrant and feel good. Hate.Fix.Hope is a vocal and piano led piece which halfway through explodes in to life with guitars and harmonised backing vocals. I have never heard the source material for "Pumped Up Kicks" but what I can tell you is, this acoustic track showcases Jim Thomas's voice proving that not only can deliver amazing vocals on record but in a live setting and err whistling ability. (edit - no idea whether Jim Thomas provided whistling). The last track is a rearranged "Stand for Something" which unfortunately lacks the kick of the original. This is one of those bands that are going to big, beg, borrow and steal your way to a concert if necessary.